Phase Eight Dress Size 14. With Tags. Gorgeous 'Phase Eight' lined dress with stretch, size 14, in excellent unmarked condition, with no noticeable signs of use. It is not looking it's best on the size 8 dummy as it is gripped on the back, but is fabulous when worn on the correct size. HAVING LOST WEIGHT AND STILL GOING! THIS DRESS HAS BEEN WORN TWICE TO WEDDINGS AND IS THEREFORE IN IMMACULATE CONDITION. A gorgeous dress from Phase Eight. The fabric of the dress is a vibrant mix of purple and green floral design on a navy background and has a good amount of stretch for the perfect fit. The top of the dress is sheer navy lace with a high round neck and full length sleeves in same sheer lace. There is a purple floral slip dress underneath that slightly shows through the lace to the bodice. A wide crossover knot design accentuates the waist and creates the hourglass silhouette. A knee length pencil skirt completes the look. A very striking but easy to wear dress that would be perfect for so many different special occasions. Size 14. Please browse my other items. Phase Eight. black Floral cold shoulder Dress. knee length. length 40". black chalk. PHASE EIGHT Cowl neck dress, pink/black. Size UK 16. lenght 106 cm, bust 100-120 cm. GORGEOUS PHASE EIGHT "SYLVIA" DRESS. GORGEOUS FOR THAT VERY SPECIAL OCCASION. AN OCCASION. IN PERFECT CONDITION. MACHINE WASHABLE. Phase Eight / 8 Lilly Stretch Jacquard dress Size 16. chest 42 inches approx waist 36 inches approx length 40 inches approx Dispatched with Royal Mail Signed For® 2nd Class. This is a great dress by PHASE EIGHT. This is a nice dress in a simple pencil bodycon formal style. On the dress is a round neck line with a large twist detail at the waist as you can see in the photos. Rrp £99.00. PHASE EIGHT DRESS. STUNNING SO VERY FLATTERING TO THE FEMININE SHAPE. GORGEOUS FOR A VERY SPECIAL OCCASION. AN OCCASION. This lovely short dress from Phase Eight is in very good condition. Attractive apple green colour with pink roses and other attractive floral prints etc. Stretch fabric with plenty of give. Width from pit to pit - 18". In a pencil bodycon style. Phase Eight. A smart casual jersey dress. The sleeves are an almost bat wing style where there are no seems connecting them to the main body of the dress but this creates a lovely shape. STRETCH FITTED BODYCONE DRESS - NAVY & STONE COLOURED POLKA DOT SPOTTY SPOTTED DESIGN. BUY IT NOW, DON'T MISS OUT! This elegant dress is made from stretch jersey fabric with a modern floral design in purple, lilac, pink, grey and black. It features gathers at the right hand shoulder, waist and skirt. The dress has a back concealed zip and is fully lined. Rrp £140.00. GORGEOUS PHASE EIGHT CRUSH WIGGLE DRESS. GORGEOUS FOR A VERY SUPER SPECIAL OCCASION. STUNNING SO VERY FEMININE. AN OCCASION. Perfect for any special occasion; weddings, christenings, races etc. Phase Eight Tweed Look Black & White Dress Size 10 - Lined. Condition is Used. Dispatched with Royal Mail 2nd Class. Mend to belt hoop (see last photo). GORGEOUS PHASE EIGHT "EDEN" DRESS. GORGEOUS FOR THAT VERY SPECIAL OCCASION. GORGEOUS RUCHED FLATTERING THE FEMININE SHAPE. AN OCCASION. FEATURES A VERY FLATTERING SQUARE NECK. phase eight dress size 18. Condition is Used. Dispatched with Royal Mail 1st Class. RRP £99.00. GORGEOUS PHASE EIGHT "CAPRI" DRESS. GORGEOUS FOR A VERY SPECIAL OCCASION. AN OCCASION. PHASE EIGHT stretch wiggle dress UK 12. KARENINA. Phase eight dress size 12 used. Rouched at sides to accentuate waist. Karenina graphic rose pattern. Zip at back with button detail above. Machine washable. Dispatched with Royal Mail 2nd Class. RRP £99.00. PHASE EIGHT DRESS. GORGEOUS FOR A VERY SUPER SPECIAL OCCASION. AN OCCASION DRESS. FULLY LINED WITH STRETCH. PHASE EIGHT. LIGHT GREY NAVY BLUE. SIZE UK 18. PATTERN AS PHOTO. NIPPED IN AT WAIST TO GIVE FLATTERING SLIMLINE LOOK. KNEE LENGTH. Beautiful rose print dress in stretch jersey fabric from Phase Eight. Elegant, stretch jersey dress with a rose design, in reds and greys by Phase Eight. This elegant dress is made from stretch jersey fabric with a rose design in reds, purple and greys. Phase Eight stretchy navy dress with a white spot pattern. This stretch, fitted dress has a cross-over bodice,side waist pleat detail and a faux wrap skirt. Phase Eight ladies navy blue polka dot, cowl neck, dress size 16. Pre-worn, this flattering dress has 3/4 length sleeves, a cowl neck with modesty panel and ruched sides. PHASE EIGHT Red Ivory Stretch Jersey Wiggle Dress UK 12 BNWT. Condition is New with tags. Dispatched with Royal Mail 2nd Class. GORGEOUS PHASE EIGHT "THEODORA" DRESS. RRP £99.00. AN OCCASION. GORGEOUS FOR A VERY SUPER SPECIAL OCCASION. FEATURES A VERY FLATTERING SQUARE NECK. FULLY LINED WITH STRETCH. Genuine PHASE EIGHT with all inner labels. Soft stretch polyester. Size UK 14. Bust - armpit to armpit - 19". Waist - 16". Phase Eight stretchy black dress with a tan floral pattern. This stretch, fitted dress hasside waist pleat detail and gathering to the shoulder. RRP £110, BNWT,Phase Eight, faboulous flattering 'Charlotte' black gold & teal floral design wiggle stretchy bodycon dress. Ideal for special occasions, weddings, cruises, garden party. PHASE EIGHT Floral Rose Print Bodycon Lined Navy Dress Size 14 New. This is a 'Charlotte' dress from Phase Eight. A black stretch jersey with teal floral, in a knee-length dress. UK size 12 / D-EU size 38-40 / US size 8. 39"/100cm Length. 36"/92cm Bust. 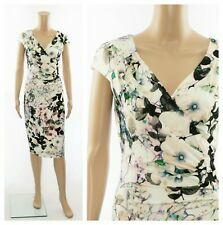 PHASE EIGHT Pink Ivory Floral Stretch Cowl Wiggle Dress UK 16. Dispatched with Royal Mail Signed For® 2nd Class. Beautiful Phase Eight “Rose” print jersey dress size 16. Ideal for special occasions ,the jersey material is very flattering with a nice stretch and fully lined. For UK sale only. Beautiful Phase eight dress stretch wiggle style size 14 new with tags . Condition is New with tags. Dispatched with Royal Mail 2nd Class.